What Do Locals Do When It’s Summer in Turks and Caicos? It’s summertime. The snow has vanished (for now) and it’s time to get outside, hit the beach and spend time with your family. However, as we head toward the end of July it’s sobering to think that summer is almost gone. But there is still time to plan the perfect vacation before you head back to work and school in September. To get you in the mood, here are some of our favorite summer activities here in Turks and Caicos… why don’t you come and join us for a few days? 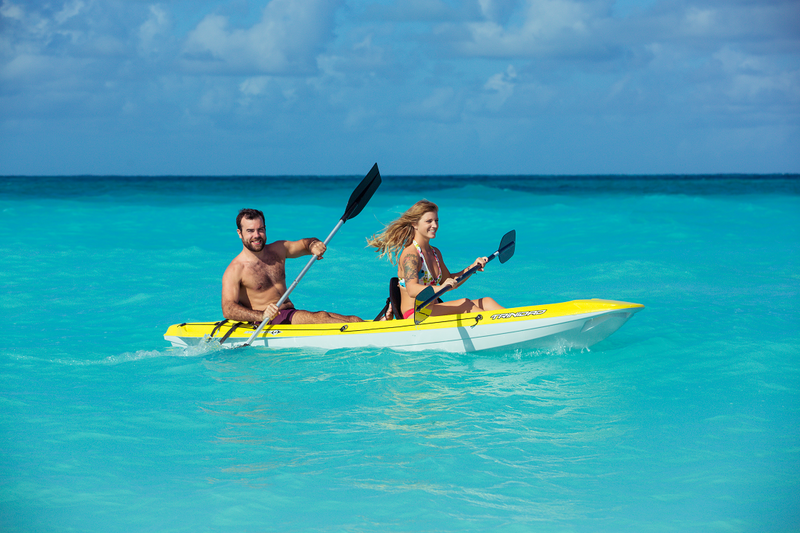 Sea kayaking is one of our favorite pastimes here at the quiet end of Grace Bay Beach. We’re near Leeward, which is home to some fantastic mangrove flats. Kayaking gives you a unique perspective on the natural beauty of Turks and Caicos, and is a great way to spend a morning out on the water, under the sun. Local operators Big Blue and our next-door neighbors WaterPlay offer kayak rentals and kayak tours. As always, call our concierge to arrange your adventure! Offered by Ocean Vibes Scuba & Watersports, this sunset cruise always has great reviews. Gliding just a few feet above one of the world’s most spectacular coral reefs just off Grace Bay beach, the colors of the tropical fish and coral are particularly brilliant in the day’s last light. We always love to rave about local favorite Spa Tropique‘s Mobile Spa Service. Thanks to this service you can enjoy a spa treatment right on the beach or in the privacy of your villa’s screened in patio! Founded in 1997, Spa Tropique is the longest-running spa company in Turks and Caicos. From heavenly massages, revitalizing scrubs, massages and other treatments, Spa Tropique offers premium spa services wherever you are on Providenciales. While Providenciales is home to some truly elegant and romantic fine dining experiences, including local favorites Bay Bistro and Coco Bistro. Plan Your Summer Trip With Us Today! Turks and Caicos offers an incredible number of things to do on a summer vacation. But Summer won’t last forever, so contact us today to plan your trip!